Vedic culture means no killing, no slavery, no hatred, no aggressors, no wickedness, no exploitation, universal brotherhood, freedom of religion/speech/thought, and full knowledge of God. Non-Vedic culture means killing, slavery, hatred, aggressors, wickedness, exploitation, no universal brotherhood, no freedom of religion/speech/thought, and unknown God (godlessness). It is very important to learn yourself and then teach the philosophy of the Eternal Religion (Sanatan-Dharma) to your children and others. By not teaching the Vedic values to others, humans become degraded into following non-Vedic cultures. Thus become killers, slavers, haters, aggressive, wicked, exploiters, narrow minded, and Godless. God is real, seen, proven, and eternal. 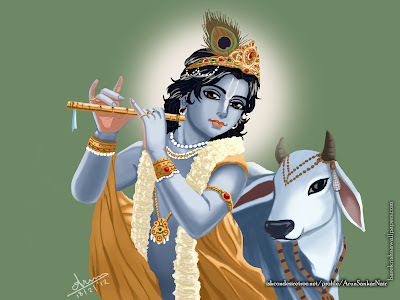 His religion is also eternal, Sanatan-Dharma. 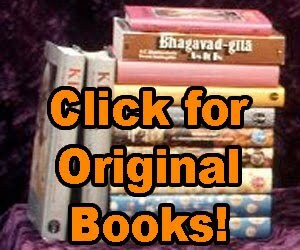 Please download unique charts/posters with Vedic knowledge and distribute them to others and help promote the truth. If you have created your own posters, which are unique and potent, please send to EternalReligion.org and these will be distributed to others. I have printed and placed these charts in 6 Temples and will place them in more Temples this year. Please do the same and help to promote the truth, Sanatan-Dharma. If you wish, you can also let me know where you place them, for my record and to inspire others. Go to the folders within the above link, open the files and right click mouse and choose ‘Save page as’ to download the pdf files. Have the pdf files printed in color, place in picture frame, hang on wall, and help spread the truth. I presented all the unique charts/posters to devotees who very much appreciated the new vision. I will place more charts in this folder, as I create them. 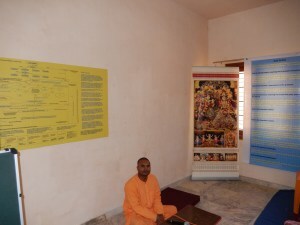 The 'Creation Tree' chart on the beck and the 'God is One' banner on the right in ISKCON Baroda preaching room. 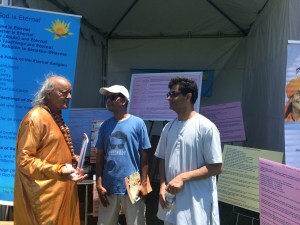 EternalReligion.org booth at the International Yoga day event in Irvine, CA , on 21JUN2015. 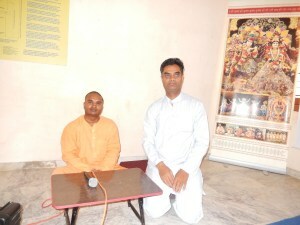 At ISKCON Baroda, after presenting the unique EternalReligion.org charts/posters. 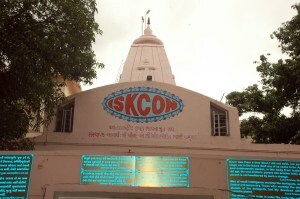 This is an ISKCON Temple in Gujarat. I placed Bhagavad-Gita verses on plates in Gujarati and English. People cannot miss them as they are at the entrance. People do read them and benefit. On a single day at least a few hundred people read these verses and thousands during festivals. We have to do our work, provide the knowledge and then leave the result of whether people become serious devotees or not to Lord Krishna. 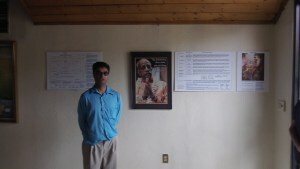 This is a picture of me at ISKCON Phoenix with some of the my posters in the back. Using the walls to spread Vedic values does work and so why waste the space? The walls are there, why keep them empty? 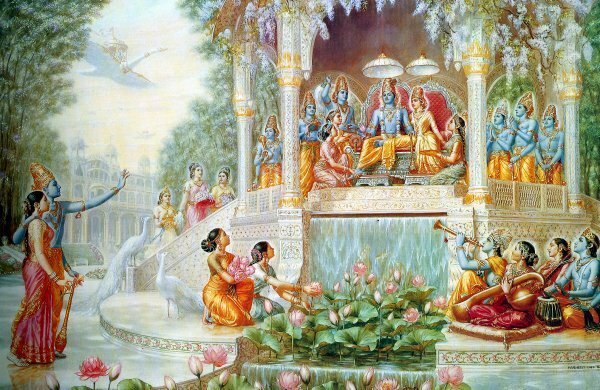 Everything is Krishna’s energy (Bhagavad-Gita 9.10), including the walls. Use His walls for preaching His instructions, mainly the Bhagavad-Gita. 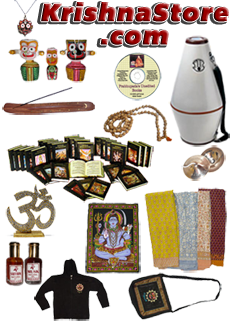 Many ISKCON and non-ISKCON Temples around the world are using the preaching material created by EternalReligion.org. Please give up your personal pleasure/leizure and join them for the benefit of Sanatan-Dharma and humanity.